Web Development Group launches new online brand for VENN STRATEGIES, a nationally recognized PR firm. 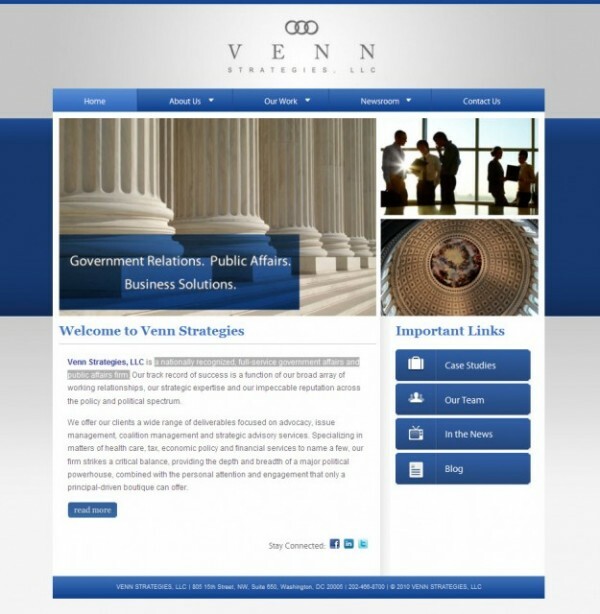 Venn Strategies, a nationally recognized, full-service government affairs and public affairs firm recently launched their new website. Key features include a new brand, case studies and the ability to connect with the firm through social media platforms. The new Venn website has a clean design with streamlined navigation and an easy-to-use functionality with a quick to contact form. The website has comprehensive information about the company’s services and easy access to the bio’s of management and staff, and more. One of the key aspects of the newly redesigned site is the company’s new social networking capabilities. Venn’s website now features a link to their Facebook fan page where fans can hear about upcoming events and keep track of company on-goings. The website also links to its blog, where the company posts about the latest happenings at Venn and within the industry.